Call of Atlantis Game Review - Download and Play Free Version! Travel to the Exotic Lands of Antiquity and Save the Lost City of Atlantis in Call of Atlantis! Deep within the heart of the Sapphire Ocean lies the great city of Atlantis. Formed by the god Poseidon, it was a haven of happiness and joy for all its people. Unfortunately the magical undersea altar from which the fabled city draws its power has been closed off! It is now up to you to save the day. Become the hero the people need and travel to exotic lands, such as Rome, Greece, Babylon, and Carthage, and retrieve powerful gems. Journey across realms of storybook fantasy and return the gems to the altar and return prosperity and happiness to the world of Atlantis. Each area contains several scenarios which will have you collecting different inventory items in one of two ways. The primary gameplay involves making matches of three or more similar icons within a grid of tiles. Your goal is to get pieces of a certain item to the bottom of the screen to collect them before time runs out. 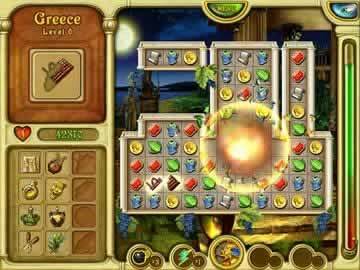 Every few levels you'll be greeted by a change in the gameplay with a hidden object puzzle, where you must find pieces or shards of four different items to complete them. 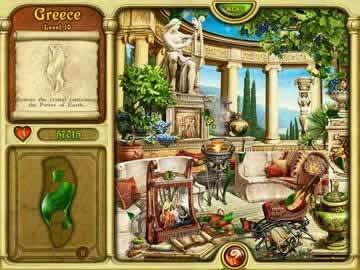 Once you have collected all of the inventory items through either game type, you will return to the hidden object scene and you need to place these items back into their correct position within the scene and unlock the ancient gem. Fair warning though, once you unlock the gem it shatters into several pieces and you must hunt the scene for all of them to finally get the gem and return it to Poseidon's altar. Call of Atlantis provides an intriguing match-3 experience and the introduction of the hidden object challenges help to boost the long-term value. Being the third game to come out in the Atlantis series, the developers have an excellent hold on game balance and everything comes together quite well and is kept moving at a brisk pace. One addition that helps make Call of Atlantis unique is the exquisitely detailed background environments. You can click on the eye at the top right of the screen and just sit back and enjoy the scenes complete with tiny supporting animations and occasional thunderstorms. The backdrops can even be unlocked as screen savers which you can activate at the main menu! So if you like polished match-3 games with a little personality, then download Call of Atlantis and start the adventure today! In Call of Atlantis, the fabled city of Atlantis is in trouble after the magical altar from which it draws power fails. You'll need to solve puzzles and complete match 3 games to unlock magical crystal gems and save the city. There are several types of puzzles you'll face as you make your way through the game. Various powerups add to the excitement and action as you solve puzzles. Not only does this game bring excellent gameplay, but great visuals as well. The majority of gameplay in the game consists of match 3 type action. You have a grid that is full of different types of items like rings and armor. Additionally, there are pieces of an item you need to piece together scattered throughout the grid. Your goal is to get these pieces to fall to the bottom of the grid by creating matches underneath them. You match three or more of one type of item in a horizontal or vertical line. You must do this by swapping adjacent items with one another. You've got a limited time to move the pieces to the bottom of the grid, so you'll need match quickly and efficiently. If you don't complete the level before time runs out, you'll lose a life. Lose them all, and it's game over. Along the way you'll come across various powerups that you can save and use when you get in trouble. These powerups can destroy a group of items, all the occurrences of one type of item, give you more time to complete the level, or allow you to make swaps you wouldn't normally be able to make. On top of match 3 levels, there are other levels that have you trying to find pieces of various items hidden throughout an image. These pieces are cleverly hidden and often difficult to spot, but there are hints available if you get stuck. There are 66 levels in Call of Atlantis that take place in or on the way to various ancient/mythical cities. Most levels consist of match 3 gameplay, while others having you finding pieces of items or placing items you've collected in their correct spots. As you progress through the game, the match 3 levels continue to increase in difficulty. You'll face obstacles like blocks that can't be removed and block the bottom of the grid, or locked items that can't be moved until they are matched and the lock is removed. You might need to collect more pieces, or might not have as much time to complete the level. While this provides a challenge, it can also be quite difficult. A mode without a time limit or difficulty settings would have been a nice addition to let players of all skill levels get through the game and experience the story. More modes could have also been added for more variety and make the gameplay less repetitive. Learning the controls and how to play Call of Atlantis is a simple task, with helpful hints and a quick explanation to get you started. This help and information allows you to jump into the game right away and focus on the action. The controls are basic and easy enough for anyone to learn and use. The presentation in this is absolutely excellent. There's an introduction that gives the basics of the game's story (with a voice over as well). There are various other cut scenes that play out as you progress through the game as well. The graphics are all very sharp and colorful. Both the graphics and music fit very well with the fantasy theme of the game, and don't detract from gameplay in any way. 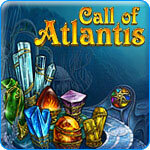 Call of Atlantis is a great match 3 game that's an excellent choice for any fan of match 3 games. There's a somewhat interesting story with cool introduction and cut scenes that you don't usually get for this type of game. There's a bit of help and hints to get you started and keep you progressing. There are a few different types of puzzles from match 3 action to finding items hidden items in a room. A consistent and excellent presentation rounds out this game nicely. It might be a bit short, but you'll enjoy it up until the last moment. Watch these short clips and check out the interesting mix of match-3, hidden object, and adventure gameplay which can be found in Call of Atlantis.